I'm one of those people that absolutely has to eat breakfast in the morning. I love the idea of shaving a few minutes off my morning routine by grabbing something quick or waiting until I get to the office to eat, but there's no way I can last that long-- my stomach feels like its practically eating itself by the time I get to the train. And that's especially true these days when I'm eating for two! In the interest of time, my weekday breakfast is usually something really quick and easy like oatmeal, cold cereal, or an English muffin and fruit. The options are limited though and I often find myself in a breakfast rut. You know those-- where you wake up and NONE of those breakfast standards sound at all appealing. So, I've been looking for some other healthy options to change up my morning eating routine and came back to one of my tried and true favorites: granola. 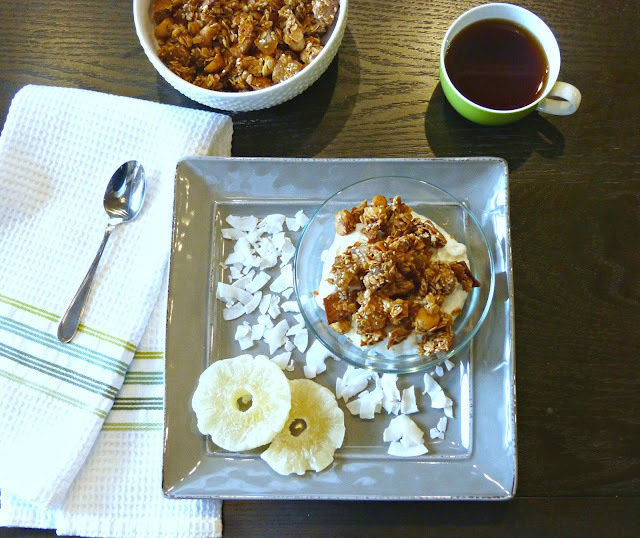 Store bought granola can be expensive and filled with ingredients that aren't necessarily that great for you so I love the idea of baking my own at home. It's more cost effective and it can be customized with any ingredients you like! 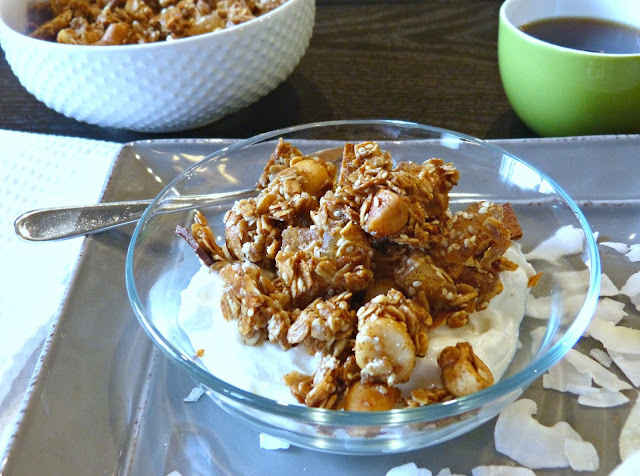 This time around, I was reminiscing about an amazing tropical-inspired granola that I ate almost every morning on our Hawaiian honeymoon a few years back. The Grand Wailea on Maui served this delicious granola packed with macadamia nuts, pineapple, and coconut everyday and I seriously couldn't get enough of it. It was the perfect quick way to start a day of fun in the sun and I bought three bags in their gift shop to bring home with me. It took no time to eat all of them. Inspired by that breakfast memory, I did a little research and then created my own homemade rendition that's a pretty good copycat, filled with wholesome ingredients and tasting like the tropics. Add a little fresh fruit and yogurt and breakfast is served! 1/4 cup dried papaya, diced *If you can't find papaya, substitute additional pineapple. I do not recommend using dried mango here. Preheat the oven to 300 degrees. In a large bowl, whisk together the cinnamon, ginger, salt, honey, oil, brown sugar, water, and vanilla extract. Add in the remaining ingredients and toss well to make sure the mixture coats completely. Spread the granola out on a baking sheet lined with parchment paper and bake until crispy, but not yet browned-- about 40 minutes, stirring once or twice in between. Allow to cool completely and store in an airtight container. I absolutely have to eat breakfast as well. My day cannot start without it. The problem is you don't always have time to cook. This is a great alternative to the 'standard' cereal and fruit meal. It will be in the frig for a quick treat. And look at those wonderful ingredients. A great alternative! Thanks for stopping by! And yes, a great alternative to the boring breakfast routine!